Carrots are crunchy, nutrient-dense, and affordable: they make great snacks, but you can also dress them up for a fancy side dish. Take a look at the nutritional benefits and get some cooking inspiration below. Orange dots show how carrots fit into the typical nutrient profile of a Paleo meal. Look for firm carrots without a lot of cracks. SEASON: Carrots are so hardy that they barely have a “season;” you can get good ones all year round. COLORS: Carrots aren’t just orange! They can also be yellow, red, purple, and white. 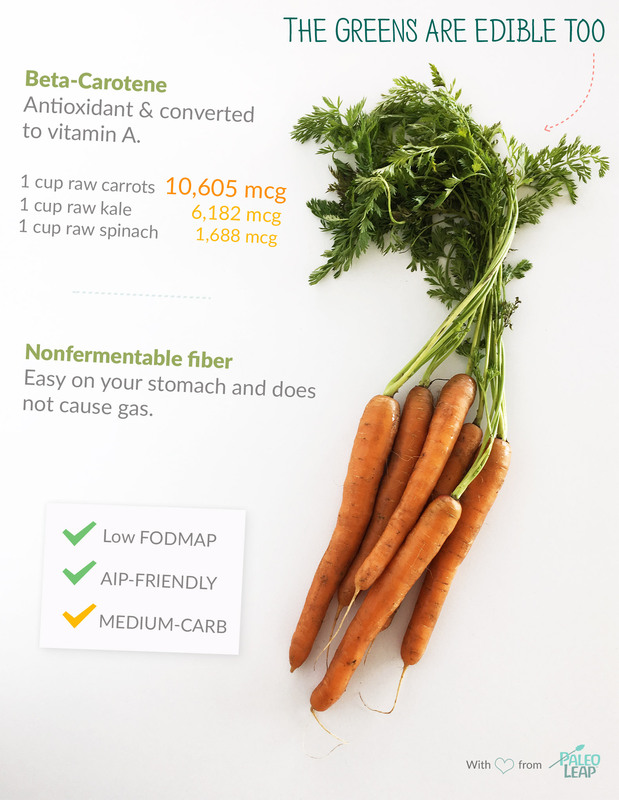 The different colors reflect the different types of antioxidants in the carrots. All the different colors taste basically the same. BABY CARROTS: Baby carrots are just regular-sized carrots cut into smaller pieces. They’re just as nutritious as regular carrots. If you’re willing to pay for the convenience of pre-cut carrots, they’re a fine choice for snacks and lunchboxes. Use as a vehicle for guacamole, homemade mayo, your favorite mustard, and more. Chop for easier eating or leave whole for a more dramatic presentation. Drizzle with olive oil and herbs and roast for 30-40 minutes, or until soft. Grill whole carrots for roughly 20 minutes and serve with melted butter or your favorite combination of oil/vinegar/herbs. Slice carrots into thin matchsticks and quickly pan-fry for a warm side dish. The greens are edible, too! Cut off just the feathery parts and use them to garnish a salad, or add some carrot tops to your pesto for a unique flavor.